Grilling doesn’t always have to be a “main dish” event. We had already decided on something else for dinner, but when Mother Nature provides a mid seventies, low humidity, full sun kind of day, I start thinking that the grill should, by all rights, be smokin’. There should be a wood aroma and thin willowy smoke coming from my backyard. So my thoughts turn to a supporting role, that of some sort of side dish to go along with our meal. 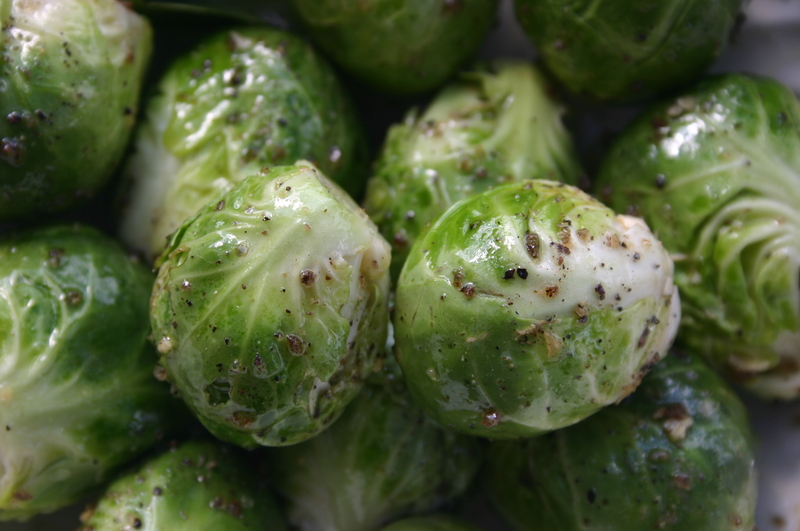 On this day, it is to be Brussels Sprouts on the grill, something I had never attempted but had always wanted to try. (And they didn’t disappoint). I started with about a pound of fresh Brussels Sprouts. When picking them out, I was consciously trying to get them all similarly sized, so the cooking time didn’t leave some under/over cooked. With my little plastic bag in hand, I was ready to give it a try. First, I gave them a trim, removing the stems and any misfit outer leaves that didn’t meet my standards. Next, it was under the faucet for a good washing. After patting them dry, I put them into a bowl, drizzled some extra virgin olive oil over them, and added the spices that I preferred. Salt and pepper are a given, but soy sauce, garlic, onion, cayenne pepper, or even brown sugar can all be possibilities. It’s your call, and what you want to do with them. You can stay safe, go crazy, or stop somewhere in between. 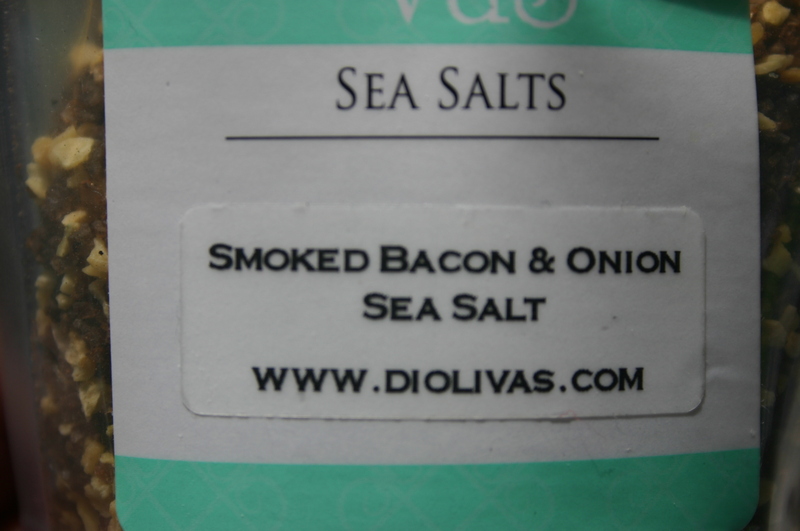 My choice, which I can only attribute to the world of food science, was this……..
Yep, smoked bacon and onion sea salt. I also added minced garlic and fresh cracked black pepper. 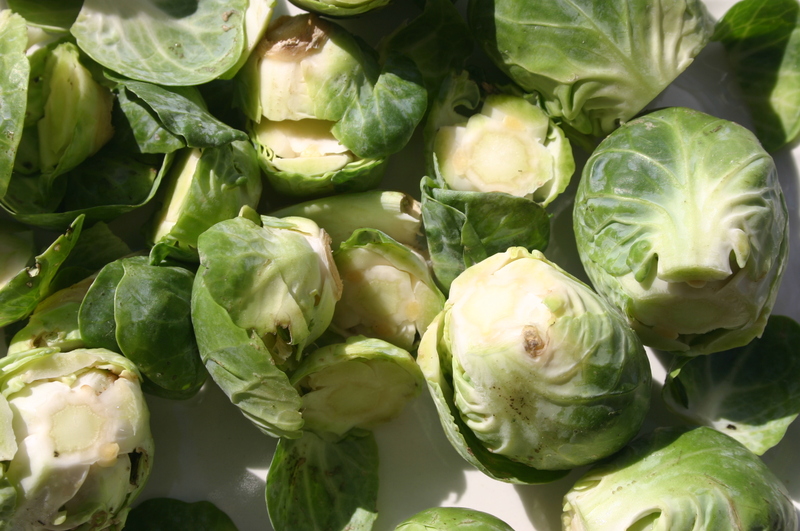 Then it was a good stir to coat all the sprouts evenly. 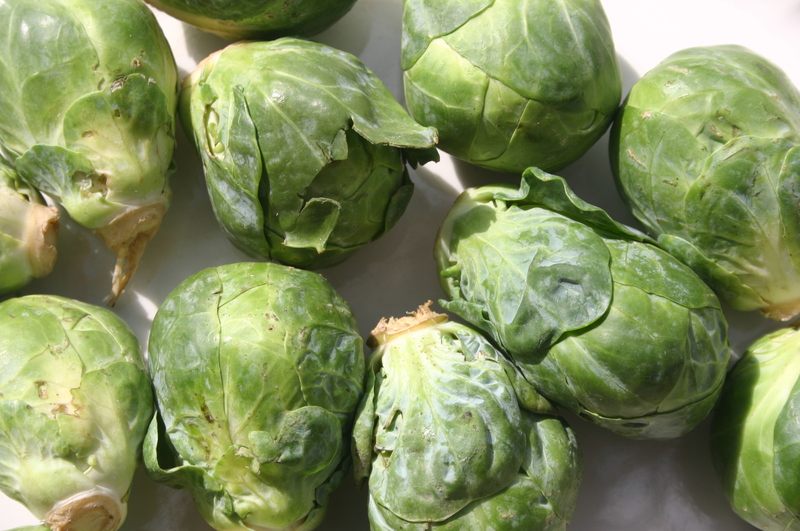 I let the sprouts sit in the bowl while I got my fire ready. These will be cooking directly over the coals, at medium heat, for a total of about twelve minutes. 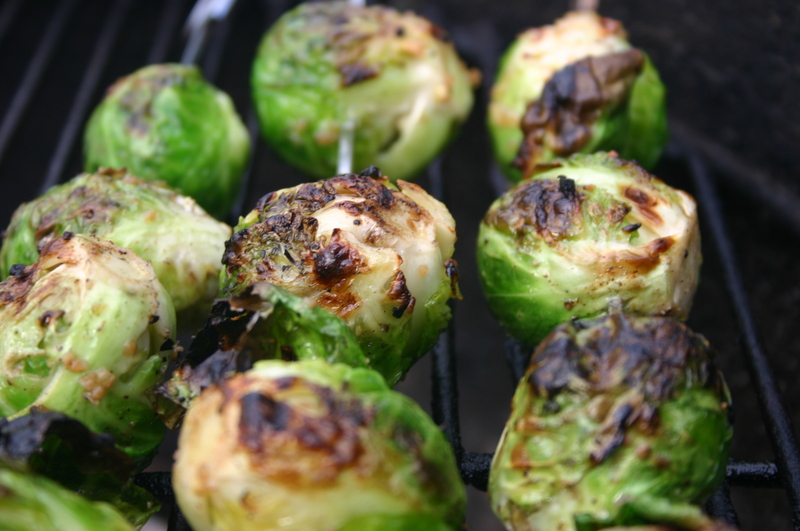 Some people like to microwave or even parboil the Brussels Sprouts before grilling, but there really is no need, and honestly, it kind of defeats the whole purpose of grilling now, doesn’t it. 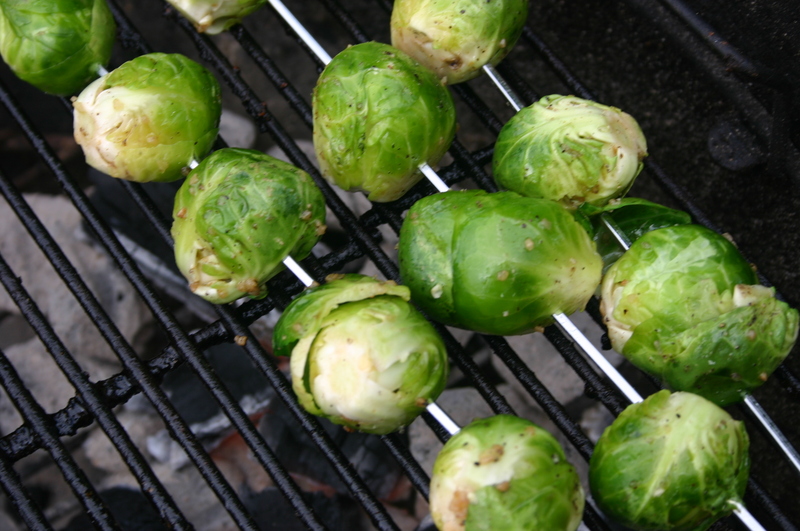 And I suppose there are some grillers that find it amusing to chase these little Brussels Sprouts all over the grill, rolling and turning them in a wild act of randomness, all the while trying to remember how much time they’ve been on the fire. Now while I love a good challenge, I really don’t want to do this. So whenever I’m faced with this sort of obstacle on the grill, I find the easiest way to regain control is to simply skewer the little suckers. 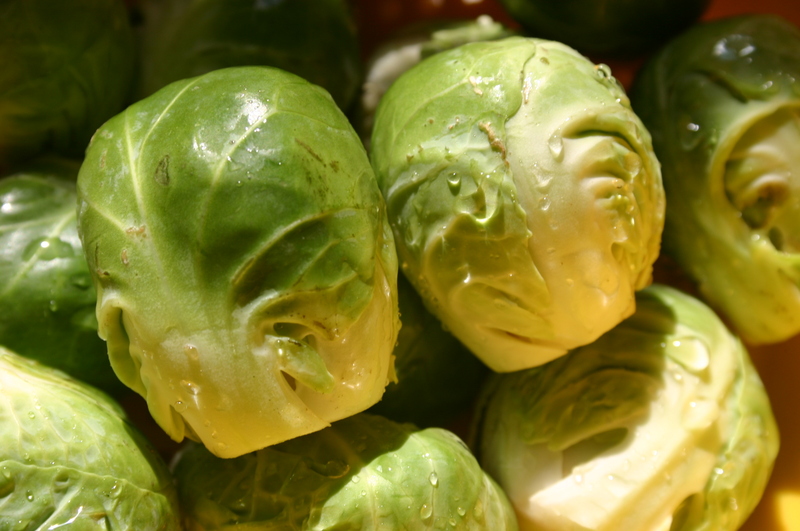 It makes moving, turning and rotating the sprouts much easier. But, whatever your decision, it’s now time for the grill. Start rotating the skewers when the sprouts start to char, probably around the three to four-minute mark. Just rotate them as you would any other food, so all the sides get charred and cooked evenly. 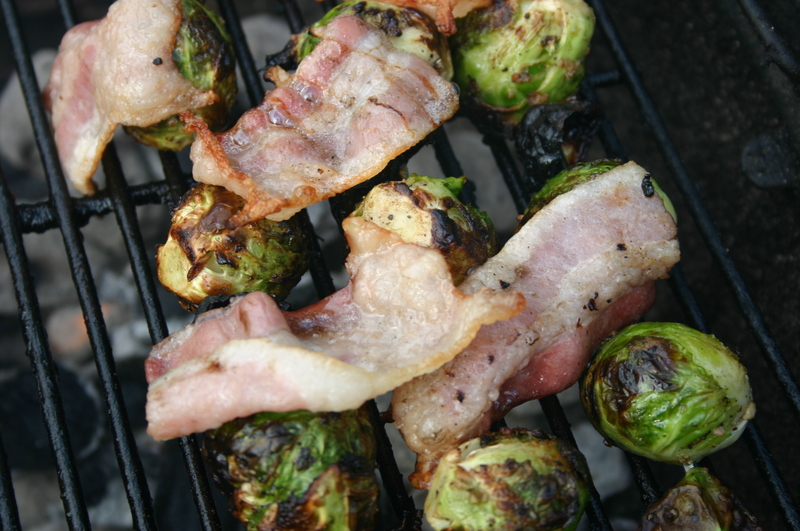 Since Brussels Sprouts are often served with bacon, I decided to take a couple of strips of thick cut bacon, cut them into thirds, and throw them on the grill at the same time. It’ll go great with the dish, and if you’ve never tried it, bacon cooks up wonderfully on the grill, getting nice and crispy, with all the fat literally dripping down and away from your food. The smoke flavor is a bonus. 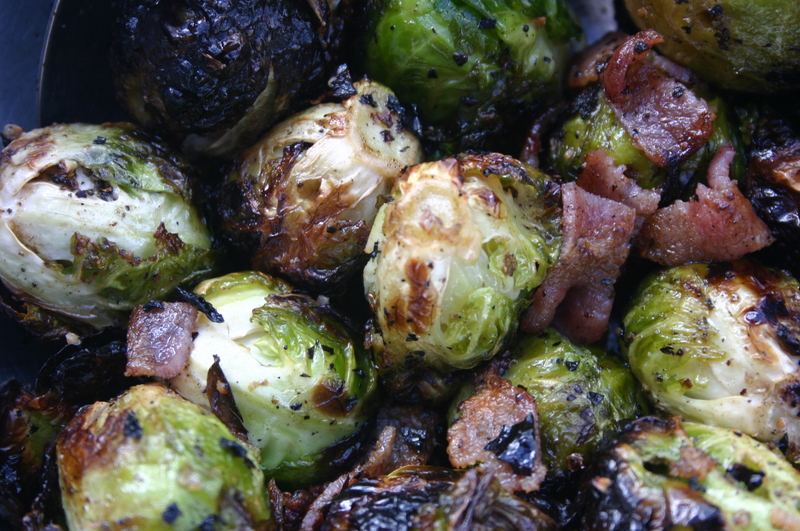 As I laid the bacon down, I had an instantaneous thought, and draped the bacon over the sprouts, for even more flavor. You’ll be able to tell with a pair of tongs when the sprouts are tender, and when they are, again, about the twelve-minute mark, plus or minus, it’s time to pull them off the grill. Lastly, I put them back into a bowl, drizzled a bit more olive oil, and added the grilled bacon, now chopped into crispy bits of goodness. A gentle stir, and they’re ready to be added to your dinner menu. They look great, smell great, and taste great,…. Yep, turned out really good, really “fresh” tasting.